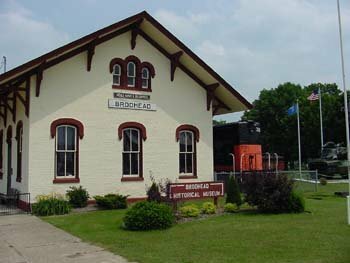 Founded in 1975, the Brodhead Historical Society operates its museum in the former Milwaukee Road depot in downtown Brodhead. The museum is open to the public at no charge, May through September, on Wednesdays, Saturdays and Sundays, or by appointment for group tours. Our mission is to protect, preserve and promote the history of Brodhead; to operate our historic Depot Museum; to show Brodhead’s rich past through annual displays and permanent displays in the depot; and to add to our collection of artifacts from Brodhead’s past. The Society holds meetings on the last Monday of each month at 7:00 p.m. in the Bank of Brodhead community room. Each meeting features a guest speaker. Check the schedule at the Meetings link above. Visit our On-Line Archive! The archive is an ongoing project to digitize our large collection of photographs and other material in order to make it available to website visitors around the world. The archive is searchable, and new additions are made frequently as volunter work progresses. We welcome your feedback. Please contact us at: info@brodheadhistory.org.